Any hockey player or coach understands that what we eat is important, but how about when you eat it? Especially for a hockey game? In this blog post, let’s review the different areas of nutritional sports science we can take advantage of and give you some practical recommendations for what you should be drinking during a game to maximize your performance and recovery. If we’re talking about general population doing some light exercise at the gym, in almost all cases there is zero need for during workout nutrition. A healthy meal 1-2 hours before physical activity would be more than enough. Hockey players are a different story. 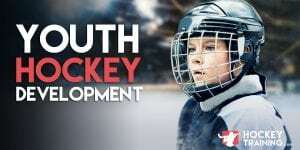 Hockey games are played at a high-level of competition, you log a lot of distance covered out on the ice, you’re active in most cases for ~2 hours, your calorie needs are higher, your carbohydrate and protein needs are higher, and you benefit largely from any small percentage performance increase we can get. Even if you’re only 5% better, that still means you get to the puck faster than the guy who isn’t. Additionally, it’s very important to point out that context matters. Nutrient timing works, but like any other tool, it must be used skillfully and in the right way under the correct situation. Gameday nutrition for hockey is different than game day nutrition for tennis. What I am providing you here today is a strategy specific for game day use, so keep it that way. Our job is to formulate a drink that is going to accomplish all of the four rules. It is important that we utilize a liquid formula in this scenario as it will metabolize faster, we can control our portions greater accuracy, and in most cases using a solid good violates rule number four. Nobody likes to eat chicken and potatoes in between periods. Having protein during a game is going to help you prevent muscle loss, which in turn dramatically increases your rate of recovery. Additionally, many hockey players forget that protein also improves rates of hydration during exercise, so we get a double effect here. You’re only going to need 10-15g of whey protein isolate, or if you prefer, 5-10g of BCAAs. My favorite products in this category are ATP BCAA, or ATP Whey Protein Isolate. Drinking carbohydrates during exercise provide your muscles with an immediate source of fuel to have access to which improves both performance on the ice and your recovery afterward. Carbohydrates also help keep our stress hormones down, and our anabolic hormones up—while providing similar underrated hydration effects such as protein during exercise. My favorite product for hockey players in this category is ATP Pentacarb. Electrolytes continue to go under-discussed in most performance circles, but they are crucial for reducing cramps, improving the potential for muscular contraction force, and are a vital component of hydration status in athletes. Many athletes think hydration is just water. It’s not. Hydration is water plus electrolytes. Electrolytes are what actually allow us to deliver this water to the muscle cell and allow us to perform like elite athletes. 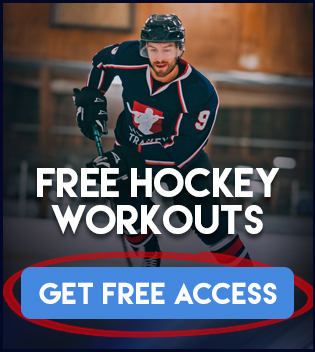 My favorite product for hockey players in this department is ATP Pentacarb again, it provides the perfect ratio of both performance-based carbohydrates and electrolytes in one formula. Water seems like the obvious solution to mix your game day hockey formula in, but what’s important to keep in mind is your calculations. A game day formula should never exceed an 8% solution. Meaning, >8% of your drink should never be in the form of powder. So, for every 500ml of water you mix your drink in, you can only have a maximum 40g of powder in it. Anymore than this tends to lead to G.I. distress and reduced rate of absorption into the muscle cells within the research. For you, this means a bloated gut and poor performance. Some hockey athletes prefer to instead drink one of these formulas and then have a banana in between periods as well instead of the carb powder, and this is fine. Whatever you’re most comfortable with. But if we are talking about optimal performance, I do prefer the carbohydrate powder based approach as it will not contain fiber and fiber is something that slows the absorption down of other nutrients during exercise. When all is said and done, hockey athletes should be consuming during-the-game nutrition every single time in one form or another. If you can’t get some of the products that I recommend (found below), you can try making your own concoction at home. But I still highly suggest following the above formulas for total amounts and solution calculation. What and when to eat is always very context specific, and according to the most recent data it is a sure thing that hockey athletes will benefit much more from incorporating a science-based approach to their nutritional performance program. 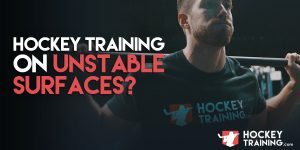 If you want a training and nutrition program to help you dominate on the ice this year, check out our Hockey Training Programs page to find the best program for you!